Note: For the first section of this walk, click here for the “maddeningly untransmissable” posting of May 3. 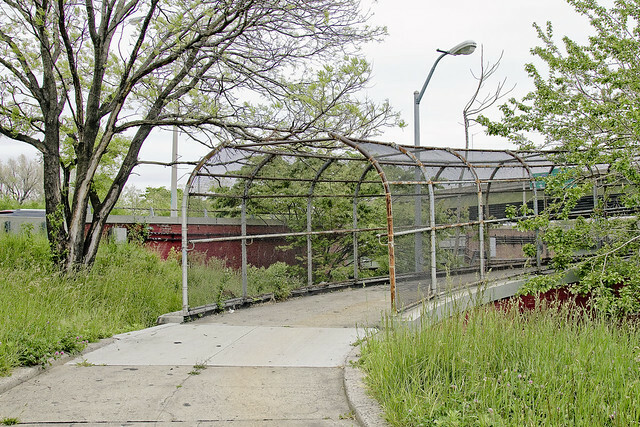 As mentioned in prior postings, those principates and potentates who occupy the proletarian palaces of Albany have prescribed that the process of replacing the 1939 vintage Kosciuszko Bridge with a modern design will begin a full year earlier than originally planned. Paramount, concern and attentions have been devoted to recording a pictorial record of the place as it exists today with the hope that future generations will be able to realize the pulsating horror envisaged by use of the acronym “DUKBO” (Down Under the Kosciuszko Bridge Onramp). 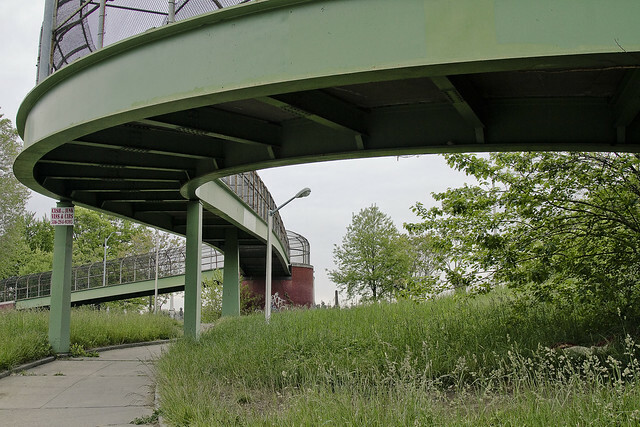 Swirling, ever swirling, the steel and concrete of the footbridge which carries pedestrian traffic from the street grid of Celtic Park to the colour stained creekland hosts a resident troll, but also offers egress to the eastern border of venerable Calvary- a street known as Laurel Hill Blvd. Gentle elevation is encountered here, and the motion followed is of a clockwise bent. 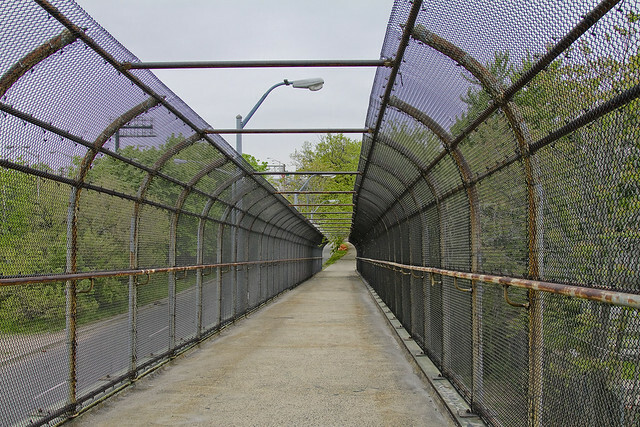 A severe fence, composed of tiny chain links, encompasses the walkway and suggests that one has entered a bizarre corridor. Cellular telephone signals seem to drop off on the bridge, isolating one from the omnipresent cloud of telecommunication radiation, but the singular device carried by your humble narrator utilizes the AT&T network so this is not that unusual. Michael Faraday himself could not have imagined a surer form of electromagnetic cage, one suspects. 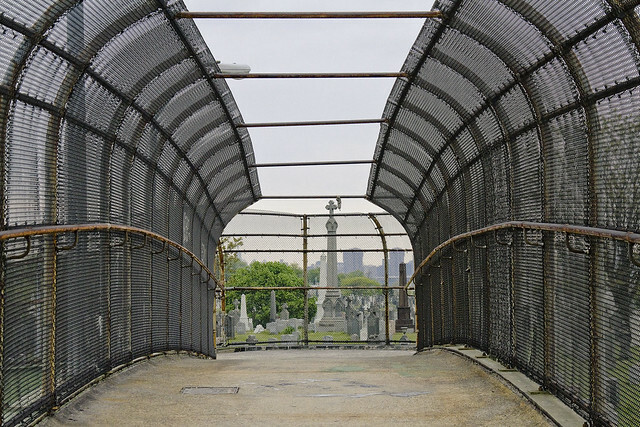 A rotunda is observed at the masonry abutment which supports the steel truss, which offers a startling view of both Calvary Cemetery and the skyline of that Shining City which lies to the north and west. 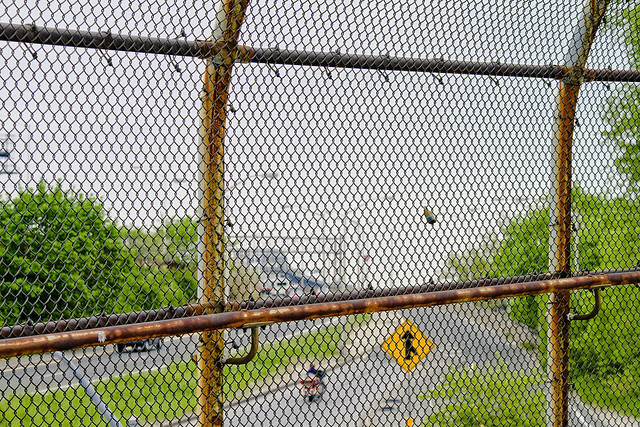 Careful observers will notice that a hole exists in the mesh at an optimum viewing angle, no doubt due to the labor of some photographer from the wicked past. This is not the work of your humble narrator, it should be pointed out, although this aperture has suffered my exploitation on more than one occasion. Beyond the emerald devastations of Calvary, whose consecrated loam and forbidden secrets lie obfuscated and reveal themselves only to the most dedicated seekers, the wholesome spire of St. Raphael’s and the fearsome Sapphire Megalith of Long Island City struggle for attention with the shield wall of a spectacular entertainment called Manhattan. The elevation enjoyed by Laurel Hill, which is in actuality a foothill of and part of the sloping eastward ascent leading to the Maspeth Plateau, allows one a perspective normally denied to all but roofers and chimney sweeps. Gaudy, modern Manhattan is merely window dressing for the wonders of New York City, a painted temple whore squamously squatting in the harbor which is designed to entertain and enthrall foreign travelers, aspirant bourgeois, and the credulous. 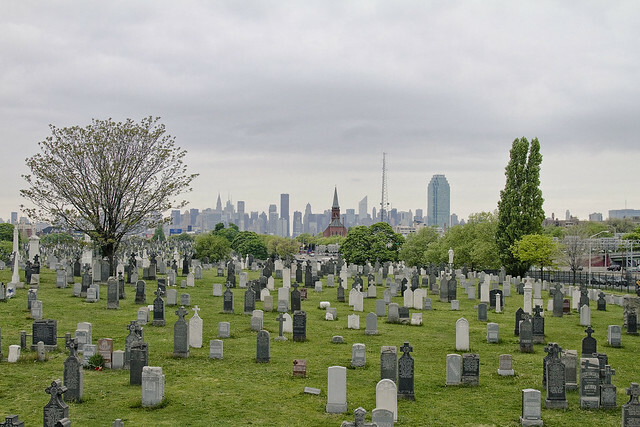 To experience the reality of New York, with it’s terrors and tragedies and naked truths and miracles- one must come to the so called “Outer Boroughs”. Here, in places like this DUKBO, there are no flashing neon lights and truth is manifested in cement, marble, and steel. 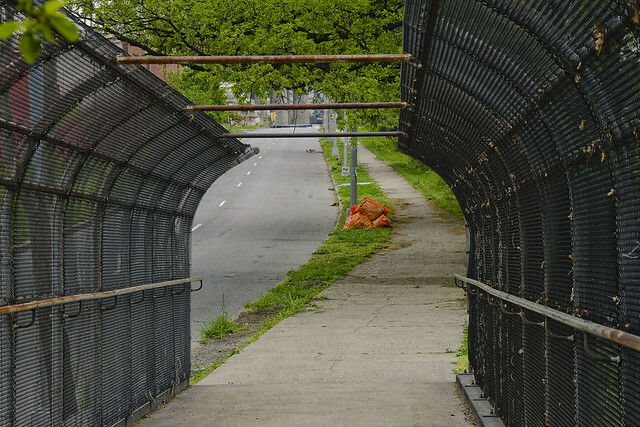 Tomorrow, we descend into the gentle valleys of DUKBO on the Queens side of the fabled Newtown Creek, and visit a location or two which will be obliterated by the construction of the new bridge, while pondering upon that which what might rise from the ashes. What unknown and unsuspected treasures might the ground imprison here, which has been unturned since 1939? Who can guess, all there is, that might be buried down there? Timorous and possessed of a weak constitution, your humble narrator nevertheless endures such journeys for the interest of both the prosaic and prurient at this, your Newtown Pentacle. That’s quite a curve to that piece of metal in the first photo. How’d dey do dat? Also, why does the chain link fencing on both sides of the walkway go up and over and then stop? Prurient? Prurience? At this your Newtown Pentacle?